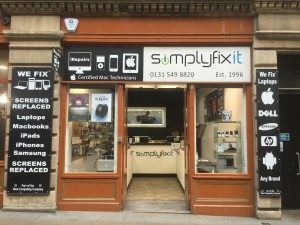 On the 13th May 2013, we opened the sixth SimplyFixIt Repair Centre, on Waverley Steps in the heart of the city centre. It was featured in the Scotsman Newspaper in June of that year. We employ Apple Certified Mac Technicians at the store, so that we can guarantee that our work is the exact same quality as Apple carry out – we're Simply cheaper. Just bring your broken device into the branch at Waverley Steps and one of our technicians will advise you on the best option. SimplyFixIt at Waverley Steps is rated an average of 4.7 (out of a maximum of 5) by 458 customers. SimplyFixIt Waverley Steps is situated in the heart of the city centre, just seconds from Princes St. It features extended opening hours and an express iPhone repair service. Waverley Station in Edinburgh was first opened in 1846 and was rebuilt between 1892 and 1902. It lies between the old town and modern Edinburgh, adjacent to Princes Street and the Princes Street Gardens. Waverley Steps were refurbished in 2011-2012, when 3 banks of double escalators and two lifts were installed to make the 40ft ascent a bit easier. The infamous wind-tunnel was also quietened with the installation of a glass roof over the top of the steps.